European art music is largely distinguished from many other non-European classical and some popular musical forms by its system of staff notation, in use since about the 11th century. Catholic monks developed the first forms of modern European musical notation in order to standardize liturgy throughout the worldwide Church. Western staff notation is used by composers to indicate to the performer the pitches (which form the melodies, basslines and chords), tempo, metre and rhythms for a piece of music. This can leave less room for practices such as improvisation and ad libitum ornamentation, which are frequently heard in non-European art music and in popular-music styles such as jazz and blues. Another difference is that whereas most popular styles adopt the song (strophic) form or a derivation of this form, classical music has been noted for its development of highly sophisticated forms of instrumental music such as the symphony, concerto, fugue, sonata, and mixed vocal and instrumental styles such as opera, cantata, and mass. The term "classical music" did not appear until the early 19th century, in an attempt to distinctly canonize the period from Johann Sebastian Bach to Ludwig van Beethoven as a golden age. The earliest reference to "classical music" recorded by the Oxford English Dictionary is from about 1829. Given the wide range of styles in European classical music, from Medieval plainchant sung by monks to Classical and Romantic symphonies for orchestra from the 1700s and 1800s to avant-garde atonal compositions for solo piano from the 1900s, it is difficult to list characteristics that can be attributed to all works of that type. However, there are characteristics that classical music contains that few or no other genres of music contain, such as the use of music notation and the performance of complex forms of solo instrumental works (e.g., the fugue). Furthermore, while the symphony did not exist prior to the late 18th century, the symphony ensemble—and the works written for it—have become a defining feature of classical music. The key characteristic of European classical music that distinguishes it from popular music and folk music is that the repertoire tends to be written down in musical notation, creating a musical part or score. This score typically determines details of rhythm, pitch, and, where two or more musicians (whether singers or instrumentalists) are involved, how the various parts are coordinated. The written quality of the music has enabled a high level of complexity within them: fugues, for instance, achieve a remarkable marriage of boldly distinctive melodic lines weaving in counterpoint yet creating a coherent harmonic logic that would be difficult to achieve in the heat of live improvisation. The use of written notation also preserves a record of the works and enables Classical musicians to perform music from many centuries ago. Musical notation enables 2000s-era performers to sing a choral work from the 1300s Renaissance era or a 1700s Baroque concerto with many of the features of the music (the melodies, lyrics, forms, and rhythms) being reproduced. That said, the score does allow the interpreter to make choices on how to perform a historical work. For example, if the tempo is written with an Italian instruction (e.g., Allegro), it is not known exactly how fast the piece should be played. As well, in the Baroque era, many works that were designed for basso continuo accompaniment do not specify which instruments should play the accompaniment or exactly how the chordal instrument (harpsichord, lute, etc.) should play the chords, which are not notated in the part (only a figured bass symbol in the bass part is used to guide the chord-playing performer). The performer and the conductor have a range of options for musical expression and interpretation of a scored piece, including the phrasing of melodies, the time taken during fermatas (held notes) or pauses, and the use (or choice not to use) of effects such as vibrato or glissando (these effects are possible on various stringed, brass and woodwind instruments and with the human voice). Although Classical music in the 2000s has lost most of its tradition for musical improvisation, from the Baroque era to the Romantic era, there are examples of performers who could improvise in the style of their era. In the Baroque era, organ performers would improvise preludes, keyboard performers playing harpsichord would improvise chords from the figured bass symbols beneath the bass notes of the basso continuo part and both vocal and instrumental performers would improvise musical ornaments. Johann Sebastian Bach was particularly noted for his complex improvisations. During the Classical era, the composer-performer Mozart was noted for his ability to improvise melodies in different styles. During the Classical era, some virtuoso soloists would improvise the cadenza sections of a concerto. During the Romantic era, Beethoven would improvise at the piano. For more information, see Improvisation. The instruments currently used in most classical music were largely invented before the mid-19th century (often much earlier) and systematised in the 18th and 19th centuries. They consist of the instruments found in an orchestra or in a concert band, together with several other solo instruments (such as the piano, harpsichord, and organ). The symphony orchestra is the most widely known medium for classical music and includes members of the string, woodwind, brass, and percussion families of instruments. The concert band consists of members of the woodwind, brass, and percussion families. It generally has a larger variety and number of woodwind and brass instruments than the orchestra but does not have a string section. However, many concert bands use a double bass. The vocal practices changed over the classical period, from the single line monophonic Gregorian chant done by monks in the Medieval period to the complex, polyphonic choral works of the Renaissance and subsequent periods, which used multiple independent vocal melodies at the same time. Many of the instruments used to perform medieval music still exist, but in different forms. Medieval instruments included the flute, the recorder and plucked string instruments like the lute. As well, early versions of the organ and fiddle (or vielle) existed. Medieval instruments in Europe had most commonly been used singly, often self accompanied with a drone note, or occasionally in parts. From at least as early as the 13th century through the 15th century there was a division of instruments into haut (loud, shrill, outdoor instruments) and bas (quieter, more intimate instruments). During the earlier medieval period, the vocal music from the liturgical genre, predominantly Gregorian chant, was monophonic, using a single, unaccompanied vocal melody line. Polyphonic vocal genres, which used multiple independent vocal melodies, began to develop during the high medieval era, becoming prevalent by the later 13th and early 14th century. Many instruments originated during the Renaissance; others were variations of, or improvements upon, instruments that had existed previously. Some have survived to the present day; others have disappeared, only to be re-created in order to perform music on period instruments. As in the modern day, instruments may be classified as brass, strings, percussion, and woodwind. Brass instruments in the Renaissance were traditionally played by professionals who were members of Guilds and they included the slide trumpet, the wooden cornet, the valveless trumpet and the sackbut. Stringed instruments included the viol, the rebec, the harp-like lyre, the hurdy-gurdy, the lute, the guitar, the cittern, the bandora, and the orpharion. Keyboard instruments with strings included the harpsichord and the virginals. Percussion instruments include the triangle, the Jew's harp, the tambourine, the bells, the rumble-pot, and various kinds of drums. Woodwind instruments included the double reed shawm, the reed pipe, the bagpipe, the transverse flute, the recorder, the dulcian, and the crumhorn. Vocal music in the Renaissance is noted for the flourishing of an increasingly elaborate polyphonic style. The principal liturgical forms which endured throughout the entire Renaissance period were masses and motets, with some other developments towards the end, especially as composers of sacred music began to adopt secular forms (such as the madrigal) for their own designs. Towards the end of the period, the early dramatic precursors of opera such as monody, the madrigal comedy, and the intermedio are seen. Around 1597, Italian composer Jacopo Peri wrote Dafne, the first work to be called an opera today. He also composed Euridice, the first opera to have survived to the present day. Baroque instruments included some instruments from the earlier periods (e.g., the hurdy-gurdy and recorder) and a number of new instruments (e.g, the oboe, bassoon, cello, contrabass and fortepiano). Some instruments from previous eras fell into disuse, such as the shawm and the wooden cornet. The key Baroque instruments for strings included the violin, viol, viola, viola d'amore, cello, contrabass, lute, theorbo (which often played the basso continuo parts), mandolin, cittern, Baroque guitar, harp and hurdy-gurdy. Woodwinds included the Baroque flute, Baroque oboe, rackett, recorder and the bassoon. Brass instruments included the cornett, natural horn, Baroque trumpet, serpent and the trombone. Keyboard instruments included the clavichord, the harpsichord, the pipe organ, and, later in the period, the fortepiano (an early version of the piano). Percussion instruments included the timpani, snare drum, tambourine and the castanets. One major difference between Baroque music and the classical era that followed it is that the types of instruments used in Baroque ensembles were much less standardized. Whereas a classical era string quartet consists almost exclusively of two violins, a viola and a cello, a Baroque or Classical-era group accompanying a soloist or opera could include one of several different types of keyboard instruments (e.g., pipe organ, harpsichord, or clavichord), additional stringed chordal instruments (e.g., a lute) and an unspecified number of bass instruments performing the basso continuo, including bowed strings, woodwinds and brass instruments (e.g., a cello, contrabass, viol, bassoon, serpent, etc.). Vocal developments in the Baroque era included the development of opera types such as opera seria and opéra comique, and related forms such as oratorios and cantatas. The term "classical music" has two meanings: the broader meaning includes all Western art music from the Medieval era to the 2000s, and the specific meaning refers to the art music from the 1750s to the early 1820s—the period of Wolfgang Amadeus Mozart, Joseph Haydn, and Ludwig van Beethoven. This section is about the more specific meaning. Classical era musicians continued to use many of instruments from the Baroque era, such as the cello, contrabass, recorder, trombone, timpani, fortepiano (the precursor to the modern piano) and organ. While some Baroque instruments fell into disuse (e.g., the theorbo and rackett), many Baroque instruments were changed into the versions that are still in use today, such as the Baroque violin (which became the violin), the Baroque oboe (which became the oboe) and the Baroque trumpet, which transitioned to the regular valved trumpet. During the Classical era, the stringed instruments used in orchestra and chamber music such as string quartets were standardized as the four instruments which form the string section of the orchestra: the violin, viola, cello and double bass. Baroque-era stringed instruments such as fretted, bowed viols were phased out. Woodwinds included the basset clarinet, basset horn, clarinette d'amour, the Classical clarinet, the chalumeau, the flute, oboe and bassoon. Keyboard instruments included the clavichord and the fortepiano. While the harpsichord was still used in basso continuo accompaniment in the 1750s and 1760s, it fell out of use in the end of the century. Brass instruments included the buccin, the ophicleide (a replacement for the bass serpent, which was the precursor of the tuba) and the natural horn. In the Romantic era, the modern piano, with a more powerful, sustained tone and a wider range took over from the more delicate-sounding fortepiano. In the orchestra, the existing Classical instruments and sections were retained (string section, woodwinds, brass and percussion), but these sections were typically expanded to make a fuller, bigger sound. For example, while a Baroque orchestra may have had two double bass players, a Romantic orchestra could have as many as ten. "As music grew more expressive, the standard orchestral palette just wasn't rich enough for many Romantic composers." New woodwind instruments were added, such as the contrabassoon, bass clarinet and piccolo and new percussion instruments were added, including xylophones, snare drums, celestas (a bell-like keyboard instrument), bells, and triangles, large orchestral harps, and even wind machines for sound effects. Saxophones appear in some scores from the late 19th century onwards. While appearing only as featured solo instruments in some works, for example Maurice Ravel's orchestration of Modest Mussorgsky's Pictures at an Exhibition and Sergei Rachmaninoff's Symphonic Dances, the saxophone is included in other works, such as Ravel's Boléro, Sergei Prokofiev's Romeo and Juliet Suites 1 and 2 and many other works as a member of the orchestral ensemble. The euphonium is featured in a few late Romantic and 20th-century works, usually playing parts marked "tenor tuba", including Gustav Holst's The Planets, and Richard Strauss's Ein Heldenleben. Modernism in music is a philosophical and aesthetic stance underlying the period of change and development in musical language that occurred from 1890 to 1930, a period of diverse reactions in challenging and reinterpreting older categories of music, innovations that lead to new ways of organizing and approaching harmonic, melodic, sonic, and rhythmic aspects of music, and changes in aesthetic worldviews in close relation to the larger identifiable period of modernism in the arts of the time. The operative word most associated with it is "innovation". Its leading feature is a "linguistic plurality", which is to say that no single music genre ever assumed a dominant position. Postmodern music is a period of music that began around 1930. It shares characteristics with postmodernist art – that is, art that comes after and reacts against modernism. Many instruments that in the 2010s are associated with popular music filled important roles in early music, such as bagpipes, theorbos, vihuelas, hurdy-gurdies (hand-cranked string instruments), accordions, alphorns, hydraulises, calliopes, sistrums, and some woodwind instruments such as tin whistles, panpipes, shawms and crumhorns. On the other hand, instruments such as the acoustic guitar, once associated mainly with popular music, gained prominence in classical music in the 19th and 20th centuries in the form of the classical guitar and banjo. While equal temperament gradually became accepted as the dominant musical temperament during the 19th century, different historical temperaments are often used for music from earlier periods. For instance, music of the English Renaissance is often performed in meantone temperament. As well, while professional orchestras and pop bands all around the world have tuned to an A fixed at 440 Hz since the late 19th century, there was historically a great variety in the tuning pitch, as attested to in historical pipe organs that still exist. Performers who have studied classical music extensively are said to be "classically trained". This training may come from private lessons from instrument or voice teachers or from completion of a formal program offered by a Conservatory, college or university, such as a Bachelor of Music or Master of Music degree (which includes individual lessons from professors). In classical music, "...extensive formal music education and training, often to postgraduate [Master's degree] level" is required. Some "popular" genre musicians have had significant classical training, such as Billy Joel, Elton John, the Van Halen brothers, Randy Rhoads, Ritchie Blackmore, and Dream Theater members. Moreover, formal training is not unique to the classical genre. Many rock and pop musicians have completed degrees in commercial music programs such as those offered by the Berklee College of Music and many jazz musicians have completed degrees in music from universities with jazz programs, such as the Manhattan School of Music and McGill University. Historically, major professional orchestras have been mostly or entirely composed of musicians who are men. Some of the earliest cases of women being hired in professional orchestras was in the position of harpist. The Vienna Philharmonic, for example, did not accept women to permanent membership until 1997, far later than the other orchestras ranked among the world's top five by Gramophone in 2008. The last major orchestra to appoint a woman to a permanent position was the Berlin Philharmonic. As late as February 1996, the Vienna Philharmonic's principal flute, Dieter Flury, told Westdeutscher Rundfunk that accepting women would be "gambling with the emotional unity (emotionelle Geschlossenheit) that this organism currently has". In April 1996, the orchestra's press secretary wrote that "compensating for the expected leaves of absence" of maternity leave would be a problem. Works of classical repertoire often exhibit complexity in their use of orchestration, counterpoint, harmony, musical development, rhythm, phrasing, texture, and form. Whereas most popular styles are usually written in song form, classical music is noted for its development of highly sophisticated instrumental musical forms, like the concerto, symphony and sonata. Classical music is also noted for its use of sophisticated vocal/instrumental forms, such as opera. In opera, vocal soloists and choirs perform staged dramatic works with an orchestra providing accompaniment. Longer instrumental works are often divided into self-contained pieces, called movements, often with contrasting characters or moods. For instance, symphonies written during the Classical period are usually divided into four movements: (1) an opening Allegro in sonata form, (2) a slow movement, (3) a minuet or scherzo (in a triple metre, such as 3/4), and (4) a final Allegro. These movements can then be further broken down into a hierarchy of smaller units: first sections, then periods, and finally phrases. Music notation from an early 14th-century English Missal, featuring the head of Christ. Catholic monks developed the first forms of modern European musical notation in order to standardize liturgy throughout the worldwide Church. The major time divisions of classical music up to 1900 are the Early music period, which includes Medieval (500–1400) and Renaissance (1400–1600) eras, and the Common practice period, which includes the Baroque (1600–1750), Classical (1750–1820) and Romantic (1810–1910) eras.} The current period encompasses the 20th century (1901–2000) and includes most of the Early modern musical era (1890–1930), the entire High modern (mid 20th-century), and the first part of the Contemporary (1945 or 1975–current) or Postmodern musical era (1930–current). The 21st century has so far been a continuation of the same period and the same Contemporary/Postmodern musical era which both began mostly in the 20th-century. The dates are generalizations, since the periods and eras overlap and the categories are somewhat arbitrary, to the point that some authorities reverse terminologies and refer to a common practice "era" comprising baroque, classical, and romantic "periods". For example, the use of counterpoint and fugue, which is considered characteristic of the Baroque era (or period), was continued by Haydn, who is classified as typical of the Classical era. Beethoven, who is often described as a founder of the Romantic era, and Brahms, who is classified as Romantic, also used counterpoint and fugue, but the romantic and sometimes yearning qualities of their music define their era. The prefix neo- is used to describe a 19th-, 20th-, or 21st-century composition written in the style of an earlier era, such as Classical or Romantic. Stravinsky's Pulcinella, for example, is a neoclassical composition because it is stylistically similar to works of the Baroque era. Burgh (2006), suggests that the roots of Western classical music ultimately lie in ancient Egyptian art music via cheironomy and the ancient Egyptian orchestra, which dates to 2695 BC. The development of individual tones and scales was made by ancient Greeks such as Aristoxenus and Pythagoras. Pythagoras created a tuning system and helped to codify musical notation. Ancient Greek instruments such as the aulos (a reed instrument) and the lyre (a stringed instrument similar to a small harp) eventually led to several modern-day instruments of a classical orchestra. The antecedent to the early period was the era of ancient music before the fall of the Roman Empire (476 AD). 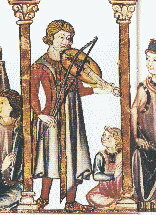 The Medieval period includes music from after the fall of Rome to about 1400. Monophonic chant, also called plainsong or Gregorian chant, was the dominant form until about 1100. Catholic monks developed the first forms of modern European musical notation in order to standardize liturgy throughout the worldwide Church. Polyphonic (multi-voiced) music developed from monophonic chant throughout the late Middle Ages and into the Renaissance, including the more complex voicings of motets. The Renaissance era was from 1400 to 1600. It was characterized by greater use of instrumentation, multiple interweaving melodic lines, and the use of the first bass instruments. Social dancing became more widespread, so musical forms appropriate to accompanying dance began to standardize. It is in this time that the notation of music on a staff and other elements of musical notation began to take shape. This invention made possible the separation of the composition of a piece of music from its transmission; without written music, transmission was oral, and subject to change every time it was transmitted. With a musical score, a work of music could be performed without the composer's presence. The invention of the movable-type printing press in the 15th century had far-reaching consequences on the preservation and transmission of music. A number of European classical musical instruments have roots in Eastern instruments that were adopted from the medieval Islamic world. For example, the Arabic rebab is the ancestor of all European bowed string instruments, including the lira, rebec and violin. Notable Medieval composers include Hildegard of Bingen, Guillaume de Machaut, Léonin, Pérotin, Philippe de Vitry, Francesco Landini, and Johannes Ciconia. Notable Renaissance composers include Josquin des Prez, Giovanni Pierluigi da Palestrina, John Dunstaple, Johannes Ockeghem, Orlande de Lassus, Guillaume Du Fay, Gilles Binchois, Thomas Tallis, William Byrd, Giovanni Gabrieli, Carlo Gesualdo, John Dowland, Jacob Obrecht, Adrian Willaert, Jacques Arcadelt, and Cipriano de Rore. The common practice period is usually defined as the era between the formation and the dissolution of the hegemony of common-practice tonality. The term usually spans roughly two-and-a-half centuries, encompassing the Baroque, Classical, and Romantic periods. Baroque music is characterized by the use of complex tonal counterpoint and the use of a basso continuo, a continuous bass line. Music became more complex in comparison with the simple songs of all previous periods. The beginnings of the sonata form took shape in the canzona, as did a more formalized notion of theme and variations. The tonalities of major and minor as means for managing dissonance and chromaticism in music took full shape. During the Baroque era, keyboard music played on the harpsichord and pipe organ became increasingly popular, and the violin family of stringed instruments took the form generally seen today. Opera as a staged musical drama began to differentiate itself from earlier musical and dramatic forms, and vocal forms like the cantata and oratorio became more common. Vocalists for the first time began adding extra notes to the music. Instrumental ensembles began to distinguish and standardize by size, giving rise to the early orchestra for larger ensembles, with chamber music being written for smaller groups of instruments where parts are played by individual (instead of massed) instruments. The concerto as a vehicle for solo performance accompanied by an orchestra became widespread. Important composers of this era include Johann Sebastian Bach, Antonio Vivaldi, George Frideric Handel, Henry Purcell, Claudio Monteverdi, Domenico Scarlatti, Georg Philipp Telemann, Arcangelo Corelli, Alessandro Scarlatti, Jean-Philippe Rameau, Jean-Baptiste Lully, and Heinrich Schütz. Wind instruments became more refined in the Classical era. While double-reed instruments like the oboe and bassoon became somewhat standardized in the Baroque, the clarinet family of single reeds was not widely used until Mozart expanded its role in orchestral, chamber, and concerto settings. Major composers of this period include Wolfgang Amadeus Mozart, Ludwig van Beethoven, Joseph Haydn, Christoph Willibald Gluck, Johann Christian Bach, Luigi Boccherini, Carl Philipp Emanuel Bach, Muzio Clementi, Antonio Salieri, Franz Schubert and Johann Nepomuk Hummel. Prominent composers of this era include Pyotr Ilyich Tchaikovsky, Frédéric Chopin, Hector Berlioz, Franz Schubert, Robert Schumann, Felix Mendelssohn, Franz Liszt, Giuseppe Verdi, Richard Wagner, Johannes Brahms, and Johann Strauss II. Prominent composers of the early 20th century include Igor Stravinsky, Claude Debussy, Dmitri Shostakovich, Sergei Rachmaninoff, Sergei Prokofiev, Arnold Schoenberg, Anton Webern, Alban Berg, Aram Khachaturian, George Gershwin, Edvard Grieg, and Béla Bartók. Although composers of this time can be considered Romantic, usually their works are not in the style of the period. Encompassing a wide variety of post-Romantic styles composed through the year 2000, 20th-century classical music includes late romantic, impressionist, neoclassical, neoromantic, neomedieval, and postmodern styles of composition. Modernism (1890–1930) marked an era when many composers rejected certain values of the common practice period, such as traditional tonality, melody, instrumentation, and structure. The high-modern era saw the emergence of neo-classical and serial music. A few authorities have claimed high-modernism as the beginning of postmodern music from about 1930. Others have more or less equated postmodern music with the "contemporary music" composed from the late 20th century through to the early 21st century. While there are differences between particular performances of a classical work, a piece of classical music is generally held to transcend any interpretation of it. The use of musical notation is an effective method for transmitting classical music, since the written music contains the technical instructions for performing the work. All critics express the opinion that it is only from the mid-19th century, and especially in the 20th century, that the score began to hold such a high significance. Previously, improvisation (in preludes, cadenzas and ornaments), rhythmic flexibility (e.g., tempo rubato), improvisatory deviation from the score and oral tradition of playing was integral to the style. Classical musicians tend to use scores and the parts extracted from them to play music. Yet, even with notation providing the key elements of the music, there is considerable latitude in the performance of the works. Some of this latitude results from the inherent limitations of musical notation, though attempts to supplement traditional notation with signs and annotations indicating more subtle nuances tend to overwhelm and paralyse the performer. [...] clarity, undeviating rhythm, easy technique, 'musicianship'. I put the word musicianship in quotes, because as often as not, it is a false kind of musicianship—a musicianship that sees the tree and not the forest, that takes care of the detail but ignores the big picture; a musicianship that is tied to the printed note rather than to emotional meaning of a piece. Improvisation once played an important role in classical music. A remnant of this improvisatory tradition in classical music can be heard in the cadenza, a passage found mostly in concertos and solo works, designed to allow skilled performers to exhibit their virtuoso skills on the instrument. Traditionally this was improvised by the performer; however, it is often written for (or occasionally by) the performer beforehand. Improvisation is also an important aspect in authentic performances of operas of Baroque era and of bel canto (especially operas of Vincenzo Bellini), and is best exemplified by the da capo aria, a form by which famous singers typically perform variations of the thematic matter of the aria in the recapitulation section ('B section' / the 'da capo' part). An example is Beverly Sills' complex, albeit pre-written, variation of "Da tempeste il legno infranto" from Händel's Giulio Cesare. The primacy of the composer's written score has also led, today, to a relatively minor role played by improvisation in classical music, in sharp contrast to the practice of musicians who lived during the medieval, renaissance, baroque and early romantic eras. Improvisation in classical music performance was common during both the Baroque and early romantic eras, yet lessened strongly during the second half of the 20th century. During the classical era, Mozart and Beethoven often improvised the cadenzas to their piano concertos (and thereby encouraged others to do so), but for violin concertos they provided written cadenzas for use by other soloists. In opera, the practice of singing strictly by the score, i.e. come scritto, was famously propagated by soprano Maria Callas, who called this practice 'straitjacketing' and implied that it allows the intention of the composer to be understood better, especially during studying the music for the first time. Classical music has often incorporated elements or material from popular music of the composer's time. Examples include occasional music such as Brahms' use of student drinking songs in his Academic Festival Overture, genres exemplified by Kurt Weill's The Threepenny Opera, and the influence of jazz on early and mid-20th-century composers including Maurice Ravel, exemplified by the movement entitled "Blues" in his sonata for violin and piano. Some postmodern, minimalist and postminimalist classical composers acknowledge a debt to popular music. Numerous examples show influence in the opposite direction, including popular songs based on classical music, the use to which Pachelbel's Canon has been put since the 1970s, and the musical crossover phenomenon, where classical musicians have achieved success in the popular music arena. In heavy metal, a number of lead guitarists (playing electric guitar), including Ritchie Blackmore and Randy Rhoads, modeled their playing styles on Baroque or Classical-era instrumental music. Certain staples of classical music are often used commercially (either in advertising or in movie soundtracks). In television commercials, several passages have become clichéd, particularly the opening of Richard Strauss' Also sprach Zarathustra (made famous in the film 2001: A Space Odyssey) and the opening section "O Fortuna" of Carl Orff's Carmina Burana; other examples include the "Dies irae" from the Verdi Requiem, Edvard Grieg's "In the Hall of the Mountain King" from Peer Gynt, the opening bars of Beethoven's Symphony No. 5, Wagner's "Ride of the Valkyries" from Die Walküre, Rimsky-Korsakov's "Flight of the Bumblebee", and excerpts of Aaron Copland's Rodeo. Several works from the Golden Age of Animation matched the action to classical music. Notable examples are Walt Disney's Fantasia, Tom and Jerry's Johann Mouse, and Warner Bros.' Rabbit of Seville and What's Opera, Doc? Similarly, movies and television often revert to standard, clichéd excerpts of classical music to convey refinement or opulence: some of the most-often heard pieces in this category include Bach´s Cello Suite No. 1, Mozart's Eine kleine Nachtmusik, Vivaldi's Four Seasons, Mussorgsky's Night on Bald Mountain (as orchestrated by Rimsky-Korsakov), and Rossini's "William Tell Overture". The same passages are often used by telephone call centres to induce a sense of calm in customers waiting in a queue. Shawn Vancour argues that the commercialization of classical music in the early 20th century may have harmed the music industry through inadequate representation. Since the range of production of classical music is from the 14th century to 21st century, most of this music (14th to early 20th century) belongs to the public domain, mainly sheet music and tablatures. Some projects like Musopen and Open Goldberg Variations were created to produce musical audio files of high quality and release them into the public domain, most of them are available at the Internet Archive website. In 1996/97, a research study was conducted on a population of preschool through college students in the Cherry Creek School District in Denver, Colorado, US. The study showed that students who actively listen to classical music before studying had higher academic scores. The research further indicated that students who listened to the music prior to an examination also had positively elevated achievement scores. Students who listened to rock-and-roll or Country music had moderately lower scores. The study further indicated that students who used classical music during the course of study had a significant leap in their academic performance; whereas, those who listened to other types of music had significantly lowered academic scores. The research was conducted over several schools within the Cherry Creek School District and was conducted through the University of Colorado. This study is reflective of several recent studies (i.e. Mike Manthei and Steve N. Kelly of the University of Nebraska at Omaha; Donald A. Hodges and Debra S. O'Connell of the University of North Carolina at Greensboro; etc.) and others who had significant results through the discourse of their work. ^ a b "Classical", The Oxford Concise Dictionary of Music, ed. Michael Kennedy, (Oxford, 2007), Oxford Reference Online. Retrieved July 23, 2007. ^ a b Julian Johnson (2002) Who Needs Classical Music? : Cultural Choice and Musical Value: p. 63. ^ The Oxford English Dictionary (2007). "classical, a." The OED Online. Retrieved May 10, 2007. 1829 V. Novello Diary 26 July in V. Novello & M. Novello Mozart Pilgrimage (1955) 181 This is the place I should come to every Sunday when I wished to hear classical music correctly and judiciously performed. ^ "On Baroque Improvisation". Community.middlebury.edu. Retrieved November 27, 2015. ^ a b c Kirgiss, Crystal (2004). Classical Music. Black Rabbit Books. p. 6. ISBN 978-1-58340-674-8. ^ Bowles 1954, 119 et passim. ^ "Cantata". Encyclopedia Britannica. Retrieved November 4, 2017. ^ "Oratorio". Encyclopedia Britannica. Retrieved November 4, 2017. ^ a b "Romantic music: a beginner's guide – Music Periods". Classic FM. Retrieved November 27, 2015. ^ "The Story of "A:" More about Baroque pitch". Philadelphia Baroque Orchestra. January 7, 2010. Retrieved November 3, 2017. ^ "Job Guide – Classical Musician". Inputyouth.co.uk. Retrieved November 27, 2015. ^ "The world's greatest orchestras". gramophone.co.uk. October 24, 2012. Retrieved April 29, 2013. ^ "The Vienna Philharmonic's Letter of Response to the Gen-Mus List". Osborne-conant.org. February 25, 1996. Retrieved October 5, 2013. ^ "Vienna opera appoints first ever female concertmaster". France 24. May 8, 2008. Archived from the original on May 5, 2009. ^ Hannah Levintova. "Here's Why You Seldom See Women Leading a Symphony". Mother Jones. Retrieved November 27, 2015. ^ Burton, Clemency (October 21, 2014). "Culture – Why aren't there more women conductors?". BBC. Retrieved November 27, 2015. ^ a b Hall, Neitz, and Battani 2003, p. 99. ^ Vladimir J. Konecni (2009). "Mode and tempo in Western classical music of the common-practice era" (PDF). Retrieved February 17, 2015. ^ Burgh, Theodore W. (2006). Listening to Artifacts: Music Culture in Ancient Israel/Palestine. T. & T. Clark Ltd. ISBN 978-0-567-02552-4. ^ Blanchard, Bonnie; Blanchard Acree, Cynthia (2009). Making Music and Having a Blast! : A Guide for All Music Students. Indiana University Press. p. 173. ISBN 978-0-253-00335-5. ^ Guides, Rough (May 3, 2010). The Rough Guide to Classical Music. Rough Guides UK. ISBN 978-1-84836-677-0. Retrieved June 21, 2018 – via Google Books. ^ "rabab (musical instrument) - Encyclopædia Britannica". Britannica.com. Retrieved August 17, 2013. ^ Ward Kingdon, Martha (April 1, 1947). "Mozart and the clarinet". Music and Letters. XXVIII (2): 126–153. doi:10.1093/ml/XXVIII.2.126. Retrieved November 5, 2017. ^ Pitcher, John (January 2013). "Nashville Symphony". American Record Guide. 76, no. 1: 8–10 – via EBSCOhost. ^ a b Citron, Marcia J. "Gender and the Musical Canon." CUP Archive, 1993. ^ a b Abbey Philips (September 1, 2011). "The history of women and gender roles in music". Rvanews.com. Retrieved November 27, 2015. ^ "In other words, exactly as it's written, nothing more and nothing less, which is what I call straitjacketing." quoted in Huffington, Arianna (2002). Maria Callas: The Woman behind the Legend, p. 76. Cooper Square. ISBN 978-1-4616-2429-5. ^ Notable examples are the Hooked on Classics series of recordings made by the Royal Philharmonic Orchestra in the early 1980s and the classical crossover violinists Vanessa Mae and Catya Maré. ^ Yeomans, David (2006). Piano Music of the Czech Romantics: A Performer's Guide. Indiana University Press. p. 2. ISBN 978-0-253-21845-2. ^ Stevens, Haley; Gillies, Malcolm (1993). The Life and Music of Béla Bartók. Oxford: Clarendon Press. p. 129. ISBN 978-0-19-816349-7. ^ Vancour, Shawn (March 2009). "Popularizing the Classics: Radio's Role in the Music Appreciation Movement 1922–34". Media, Culture and Society. 31 (2): 19. doi:10.1177/0163443708100319. Retrieved April 24, 2012. ^ Prelude or requiem for the 'Mozart effect'? Nature 400 (August 26, 1999): 827. ^ Ross, Alex. "Classical View; Listening To Prozac... Er, Mozart", The New York Times, August 28, 1994. Retrieved on May 16, 2008. ^ "The Impact of Music Education on Academic Achievement" (PDF). Archived from the original (PDF) on September 16, 2012. Retrieved 1 February 2012. Bowles, Edmund A. 1954. "Haut and Bas: The Grouping of Musical Instruments in the Middle Ages". Musica Disciplina 8: 115–40. Hall, John R., Mary Jo Neitz, and Marshall Battani. 2003. Sociology on Culture. Sociology/Cultural Studies. London and New York: Routledge. ISBN 978-0-415-28484-4 (cloth); ISBN 978-0-415-28485-1 (pbk). Karolyi, Otto. 1994. Modern British Music: The Second British Musical Renaissance – From Elgar to P. Maxwell Davies. Rutherford, Madison, Teaneck: Farleigh Dickinson University Press; London and Toronto: Associated University Presses. ISBN 0-8386-3532-6. Grout, Donald Jay; Palisca, Claude V. (1996) A History of Western Music, Fifth edition. W.W. Norton & Company. ISBN 0-393-96904-5 (hardcover). Hanning, Barbara Russano; Grout, Donald Jay (1998 rev. 2009) Concise History of Western Music. W.W. Norton & Company. ISBN 0-393-92803-9 (hardcover). Schick, Kyle (2012). "Improvisation: Performer as Co-composer", Musical Offerings: Vol. 3: No. 1, Article 3. Sorce Keller, Marcello (2011) What Makes Music European. Looking Beyond Sound. Latham, New Jersey: Scarecrow Press. Carnatic music, Karnāṭaka saṃgīta, or Karnāṭaka saṅgītam, is a system of music commonly associated with southern India, including the modern Indian states of Andhra Pradesh, Telangana, Karnataka, Kerala, and Tamil Nadu, as well as Sri Lanka. It is one of two main subgenres of Indian classical music that evolved from ancient Hindu traditions, the other subgenre being Hindustani music, which emerged as a distinct form because of Persian or Islamic influences from Northern India. The main emphasis in Carnatic music is on vocal music; most compositions are written to be sung, and even when played on instruments, they are meant to be performed in gāyaki (singing) style. Carnatic music is usually performed by a small ensemble of musicians, consisting of a principal performer (usually a vocalist), a melodic accompaniment (usually a violin), a rhythm accompaniment (usually a mridangam), and a tambura, which acts as a drone throughout the performance. Other typical instruments used in performances may include the ghatam, kanjira, morsing, venu flute, veena, and chitraveena. The greatest concentration of Carnatic musicians is to be found in the city of Chennai. Various Carnatic music festivals are held throughout India and abroad, including the Madras Music Season, which has been considered to be one of the world's largest cultural events. Classic FM (stylised as Classic fM) is one of the United Kingdom's three Independent National Radio stations. The station broadcasts classical music. The Classical period was an era of classical music between roughly 1730 and 1820.The Classical period falls between the Baroque and the Romantic periods. Classical music has a lighter, clearer texture than Baroque music and is less complex. It is mainly homophonic, using a clear melody line over a subordinate chordal accompaniment, but counterpoint was by no means forgotten, especially later in the period. It also makes use of style galant which emphasized light elegance in place of the Baroque's dignified seriousness and impressive grandeur. Variety and contrast within a piece became more pronounced than before and the orchestra increased in size, range, and power. Gramophone is a magazine published monthly in London devoted to classical music, particularly to reviews of recordings. It was founded in 1923 by the Scottish author Compton Mackenzie. It was acquired by Haymarket in 1999. In 2013 the Mark Allen Group became the publisher.The magazine presents the Gramophone Awards each year to the classical recordings which it considers the finest in a variety of categories. Indian classical music is the classical music of the Indian subcontinent. It has two major traditions: the North Indian classical music tradition is called Hindustani, while the South Indian expression is called Carnatic. These traditions were not distinct till about the 16th century. There on, during the turmoils of Islamic rule period of the Indian subcontinent, the traditions separated and evolved into distinct forms. Hindustani music emphasizes improvisation and exploring all aspects of a raga, while Carnatic performances tend to be short and composition-based. However, the two systems continue to have more common features than differences.The roots of the classical music of India are found in the Vedic literature of Hinduism and the ancient Natyashastra, the classic Sanskrit text on performance arts by Bharata Muni. The 13th century Sanskrit text Sangita-Ratnakara of Sarangadeva is regarded as the definitive text by both the Hindustani music and the Carnatic music traditions.Indian classical music has two foundational elements, raga and tala. The raga, based on swara (notes including microtones), forms the fabric of a melodic structure, while the tala measures the time cycle. The raga gives an artist a palette to build the melody from sounds, while the tala provides them with a creative framework for rhythmic improvisation using time. In Indian classical the space between the notes is often more important than the notes themselves, and it does not have Western classical concepts such as harmony, counterpoint, chords, or modulation. Classical Turkish music (Turkish: Türk sanat müziği, "Turkish art music"; or Klasik Türk müziği, "Classical Turkish music"), sometimes known as Ottoman classical music, developed in Istanbul and other major Ottoman cities and towns through the palaces and Sufi lodges of the Ottoman Empire. Above all a vocal music, Ottoman music traditionally accompanies a solo singer with a small instrumental ensemble. In recent times, instruments might include tambur (lute), ney (flute), kemençe (fiddle), keman (Western violin), kanun (zither), or other instruments. Sometimes described as monophonic music, the variety of ornamentation and variation in the ensemble requires the more accurate term heterophonic. Persian traditional music or Iranian traditional music, also known as Persian classical music or Iranian classical music, refers to the classical music of Iran (also known as Persia). It consists of characteristics developed through the country's classical, medieval, and contemporary eras.Due to the exchange of musical science throughout history, many of Iran's classical melodies and modes are related to those of its neighboring cultures. The violin was first known in 16th-century Italy, with some further modifications occurring in the 18th and 19th centuries to give the instrument a more powerful sound and projection. In Europe, it served as the basis for the development of other stringed instruments used in Western classical music, such as the viola.Violinists and collectors particularly prize the fine historical instruments made by the Stradivari, Guarneri, Guadagnini and Amati families from the 16th to the 18th century in Brescia and Cremona (Italy) and by Jacob Stainer in Austria. According to their reputation, the quality of their sound has defied attempts to explain or equal it, though this belief is disputed. Great numbers of instruments have come from the hands of less famous makers, as well as still greater numbers of mass-produced commercial "trade violins" coming from cottage industries in places such as Saxony, Bohemia, and Mirecourt. Many of these trade instruments were formerly sold by Sears, Roebuck and Co. and other mass merchandisers.